Meet Steve Chen the man behind the GemWhere Smart Watch, the best smart watch out there today. We’ve seen a lot of smart watches so far. Most of them are filled with glitzy cool features, but one smartwatch has stood out as a truly functional piece of equipment that you can wear on your wrist. That smart watch is the GemWhere Smart Watch. Designed and engineered by software engineer Steve Chen, the focus for the GemWhere smart watch is on really providing the information you need, when you need it, in the most unobtrusive way possible. The GemWhere smartwatch features a color display, a daily briefing format for the most important news and an audible assistant ala Siri that can read important news and information to you. The GemWhere Smart Watch is also a stand alone smart watch which doesn’t require the pairing of a smartphone, but can pair to an Android or iOS device if you so choose. We got a chance to talk with Chen a little more in depth. Check out the interview below. Steve tell us a little bit about how the GemWhere Smart Watch is different from other smart watches on the market today? The GemWhere smart voice watch is different because it reads information to the user. That’s why we call it the smart Voice watch. What makes it unique is the software system that we developed for it. The software is able to generate key words and key points from news, blogs, and other information and read it to the user. Given the limited screen size of smart watches, this makes perfect sense and a better user experience. While many smart watches seem to have broad implications, GemWhere is designed to simplify things, but with a lot more features, how did you go about that? There is a lot of content available on the Internet. Almost all of the content available is designed for the desktop and mobile devices. For example, a news article general runs around 1,000 words. So is blog. 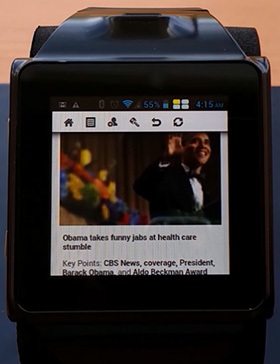 How do we access useful content on a smart watch given its compact size? We need simplified information. The GemWhere smart voice watch lets you access those news, blogs, and other useful and meaningful information in a simplified fashion. We turn long and useful information into simple and useful information. The GemWhere watch lets you access non-trivial and useful information. If we look at user behavior, a lot of times, we use mobile devices to access emails, web sites, news, and blogs, etc. The GemWhere watch simplify news, blogs, emails, and web sites for you. It even lets the user search the web and get results in a simplified fashion. GemWhere is built on it’s own proprietary software with Android in the background what are some of the benefits from having it’s own software? Having its own software is a necessity. The proprietary software is what provides the simplified information, simple news, simple blogs, and simplified web search. It is really what sets us apart from all the other smart watches. Gemwhere can be used in conjunction with an Android phone, iOS device or even without a phone, tell us about it’s cellular capability. The GemWhere watch comes with built in GSM data capability, so you can wear it and access all the simplified information without carrying a smart phone around. It is not a mere remote control of your smart phone. The GemWhere smart voice watch provides un-tethered data access through GSM data networks, Wifi, and Bluetooth. Now you’re a software engineer with lots of experience in computable devices, did you develop Gemwhere and the software on your own? Yes, I developed the software and GemWhere on my own with lots of advice and feedback from my friends and colleagues that I have worked with. There is also an accompanying web site, gem.is Check it out! I have patent applications pending for the software system and the smart watch design. We will implement some of the very innovative watch design features in future versions of the GemWhere watch. You can get the same simplified news on gem.is. The GemWhere smart voice watch, the gem.is web site, and the underlying software that powers them are all contributing to our vision of making information simple, mobile, and social! It seems that many of the smart watches on the market today are more about showy features that people don’t really need,do you see the GemWhere smartwatch as more functional? Explain? Absolutely, I firmly believe providing meaningful, non-trivial, and useful information in a simple fashion is very important. Smart watches are essentially information and entertainment devices. I believe a lot of attention has to be paid to the design. But instead of focusing on the exterior, the software that powers the smart watch should be the most important differentiating feature. The software is what powers the whole user experience. By providing simplified information, the GemWhere watch connects the user to the Internet in an un-tethered way, and provides useful information to the user at a glance. That is what really sets the GemWhere watch apart. You can pre-order the GemWhere Smart Watch on Kicksarter here.